Trump Faces Critical Phase, As He Tries To Make His Rhetoric Reality The GOP deadline to pass health care is the first week of April. If it doesn't happen, everything else gets pushed back. Trump's agenda faces two big tests this week, from the Supreme Court to Russia. President Trump attends a meeting on health care at the White House last week. The bill is facing opposition from all sides. Without its passage, everything else on Trump's agenda could be slowed. Donald Trump likes to move fast. But to this point, for all the bravado, executive actions and tweets, much of Trump's presidency has been showy without a lot of practical effect. For that to change, much could depend on the next three weeks. This critical phase could set his ambitious agenda on course or derail it. The reason: Republicans have set a goal of passing the first phase of the Affordable Care Act replacement before the April recess, so they don't have to go home for two weeks and hear it from both sides. That means getting it through by the week of April 3. House leaders plan to bring the bill to a full House vote on Thursday. That's despite its facing pushback left, right and center. "It's an important transition time," said Mike DuHaime, who ran New Jersey Gov. Chris Christie's presidential campaign and is close to Bill Stepien, Trump's political director. He added, "The next three weeks are important in setting the table and making progress. ... They do need to start showing progress." But first, Trump's agenda faces a trio of major tests Monday with dueling congressional hearings — into the confirmation of his Supreme Court pick, Neil Gorsuch, and the investigation into Russian meddling in the election — as well as his ability to make the sale on health care when he rallies in Kentucky. Despite Democrats being under pressure to resist, Gorsuch, who has sterling legal credentials, is expected to be confirmed. He has so far shown himself to be poised and unlikely to be caught in any of the usual traps. But Gorsuch could be tested when it comes to his social conservatism, his role in Bush-era terrorism policies (including the use of torture and warrantless surveillance), his views of the judiciary and Trump's travel ban. The Russia issue threatens to hobble Trump's presidency, as it is likely to be an ongoing nuisance for the Trump White House. Controversy related to it has already cost Trump his first national security adviser, Michael Flynn. And his attorney general, Jeff Sessions, recused himself from any investigations into the Trump presidential campaign following revelations that Sessions wasn't completely forthcoming during his confirmation hearing about his own contact with the Russian ambassador. Congress has subpoena power, which means that something could come out of the investigation that hasn't been in the public domain as yet. So far, there has been some smoke between Trump and Russia, but no fire. And for liberals thinking (hoping) Trump will be impeached because of it, that's highly unlikely. Short of Trump being found to be on the payroll of the Kremlin, don't expect a Republican Congress to impeach a president of its own party. What's more, next year is an election year, and the campaign for 2020, believe it or not, is right around the corner. The likelihood is if Democrats want to take down Trump, they're going to have to do it at the ballot box. Trump has set out an ambitious agenda meant to capitalize on his campaign promises. That has consisted of more than two dozen executive actions (including a travel ban of first seven, then six majority-Muslim countries and moving toward building a wall along the U.S.-Mexico border) as well as picking Gorsuch to replace conservative icon Antonin Scalia on the Supreme Court. Not everything has gone well. 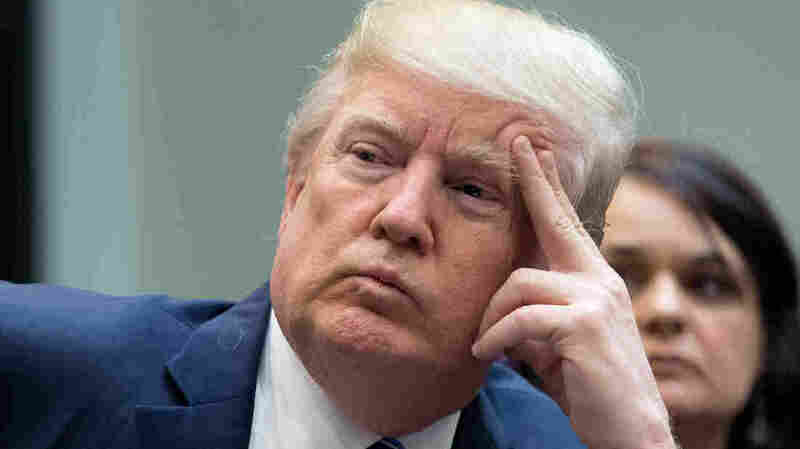 Two iterations of his travel ban have gotten hung up in the courts; Trump introduced a radical budget that ramps up military spending and cuts almost everything else, but is dead on arrival in Congress; and intraparty fighting is threatening to derail the GOP health care plan. "I'm wary of assigning the term 'defining moment' on anything related to Trump, since he has demonstrated an ability to create entirely new news cycles or controversies as soon as the current one presents him problems," said GOP strategist Kevin Madden, who was a senior adviser to Mitt Romney's 2012 presidential campaign and worked on Capitol Hill for Tom DeLay and John Boehner when they were majority leaders. "He [Trump] has an ability to persevere not shared by many conventional politicians. But the repeal-and-replace effort is important, because it's a promise that has been promoted for seven years, and the expectations for delivering on it are high." But delivering might be tougher than Republicans and Trump may have thought. Right now, it seems, the bill, as currently written, doesn't have the votes. Asked if it did by CNN's Jake Tapper, House Speaker Paul Ryan deflected, calling Tapper's question "goofy." "When you make the case to voters for three consecutive election cycles that the only ingredients needed for repealing Obamacare are a Republican Congress and control of the White House, the pressure is on to deliver," Madden reiterated. Trump takes the show on the road Monday in Kentucky, a state that has had — by most standards — success in implementing the Affordable Care Act through its exchange, Kynect. The bill took a hit last week when the Congressional Budget Office said it would increase premiums in the short run, provide plans with less coverage and very likely cause millions to lose their health insurance. Kentucky is a state with lots of Trump voters, and he will be tested on his ability to convince them that this bill — or something else — is something they should support. "I think he's going to be very important doing that, especially in districts he won overwhelmingly," DuHaime said. He noted that Trump's "personal popularity and willingness to use that could be influential" in those places. But that's going to be tested. That's key, because without health care out of the way, it will be very difficult for the GOP to move on to tax reform or a big infrastructure bill, something that is a priority of White House chief strategist Steve Bannon, who sees it as key to Trump's re-election. "Republicans are very much expecting significant tax reform," DuHaime said, adding, "If we're into the summer, and we don't see any movement on tax reform," that would be a problem. Overall, Madden pointed out, "We're talking about a legislative agenda that, if you include tax reform, immigration, infrastructure and other priorities, would ordinarily consume two full terms. Passing this first test with health care reform will be an important gauge for the prospects of that larger agenda."